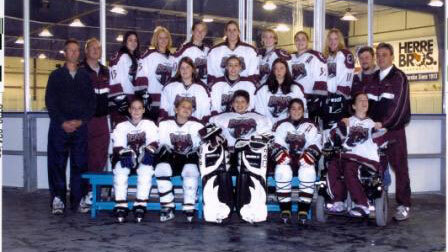 When I was 12 years old, our neighbor invited my sister, Lauren, to play on a girls’ ice hockey team. I watched my sister play all kinds of sports: basketball, soccer, and softball. I was almost a teenager, and I was tired of just watching. I wanted to participate and feel part of something like she did. She helped me make a spreadsheet that listed the names of all the players, and then had columns for “Games Played,” “Goals,” “Assists,” “Points,” “Penalties,” etc. After each of our games, I got the score sheet from our coach. I would go home and enter the numbers into my spreadsheet. It was my responsibility to keep the spreadsheet updated so my teammates and coach knew how we were doing. This prepared me for inclusive, integrated employment because if I didn’t do it, someone else would have needed to – it wasn’t just “busy work” to make me “feel good.” They actually looked at my spreadsheet. I knew my coach and teammates were counting on me, so I wanted to be dependable and do the best job I could. This is also something employers look for. involved in ice hockey, I don’t think I would have the same confidence I have now (something else employers look for). It was a great social activity, too. Since we were a travel team, we got to travel to different states on the weekends. I even skated on the ice during our practices and public skate. Growing up, I had a lot of anxiety. Being involved in ice hockey helped teach me to problem solve. Before ice hockey, when I encountered an obstacle, I would think, “I’m the only one who has this problem.” I think I felt alone. I saw how my teammates handled their obstacles. I realized a lot of the things I was experiencing that caused my anxiety weren’t unique. They were normal teenage problems. I wasn’t alone. Looking back, I think this is a vital thing for people with disabilities to know. The things you experience might not be because of your disability. They might be normal. Everyone experiences obstacles. You just have to try to handle them in a positive way. So, being part of the ice hockey team helped me to build the skills necessary for competitive integrated employment, including the need to be responsible and held accountable; teamwork and working with various personalities; understanding the normalcy of emotions such as anxiety; and problem-solving on a regular basis. Alexa, you are such an inspiration. And you always have been! I am so blessed to have been a part of this team with you. It definitely would not have been the same without you. Thank you for teaching me so much during our hockey years!